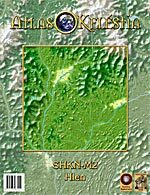 During the past week, Keléstia Productions have posted some updated versions of previously published Atlas Keléstia map squares. The changes were made to fix typographical errors, to add some items missing from data tables, and to make some other minor corrections. If you have purchased any of the following maps, you can obtain a free copy of the revised document(s) by going to your account profile's files tab and then just click on the product to download.